so this is a system that i have moved onto 'vapor' pressure, i.e. under a pound although it never tripped the old steam limit so it may have been vapor all along, with 6 mains to 6 apartments. single pipe but the mains are parallel flow each full circuit return to boiler and because the old snow man was replace with a nice low burnham atmospheric I have over the 28" A/B difference to do away with the condensate pump. Presently the returns are all 2" except one that is 1.5". that all discharge into 1" [email protected] Trap and 1" lines to the condensate tank. I don't have the actual figures for radiation on each leg although i thought of maybe opening the union under one of the traps and just measuring the condensate in an hour of firing at design temp kinda thing would give me a rough idea of how much condensate i'm trying to move by gravity. But is there a rule of thumb, if you had one main at 2" like 1 or 1 and 1/4" wet return? And maybe if i can translate that condensation into steam I can figure how large an air vent I ought to be adding at the end of the dry return. After reading the threads on propress and steam returns (unless there has been a change), i'm thinking i'm going to sweat this stuff 95/5. The equalizer on this job is already copper so easy join. the combined return for all legs I'm going right up the equalizer size of 2". the wet return manifold will have 4 elbows. and about 8 feet of pipe. Any other thoughts, cautions, etc. appreciated. Do you have the total EDR? You can size for wet/dry return that way. Maybe some pictures would help too. Best to size by edr or measuring actual condensate. Traps should be sized for the condensing load x 2 to allow for piping and pick up. i'm setting up to measure condensate. i can post a picture of the current set up. three of the 1" traps actually drop into a single 1" manifold that then drops into the condensate tank. one from each side to pick up all 6 traps. obviously this isn't fighting any raised pressure. once i have the condensing load, do i measure that from cold start til end of cycle and divide by time or hot steaming over certain period and then extrapolate. . . what is the formula for calculating size once i've got the result. I was planning on the loop being the trap and air vent the ends of the main. the condensate test would probably also help me size that vent . . .
also, i read article on the gifford loop which specifies a minimum of 1/2 inch above the autofeeder trigger level but it doesn't specify a range. I have a really convenient tapping to test this that is 10" above that level on an equalized loop, but i still have 31" from that weir to the steam mains. It's only big enough to test a single return but it would make it really easy to test one of the returns which i would set up so I could monitor that the water level didn't reach a tee a couple inches below the mains. for that matter, i'm now intrigued by the idea of using a few feet of polycarbonate test drop and i could actually watch the water level. I" polycarbonate is essentially quite similar to CTS. the material has like a 280 degree resistance to deformation, i'm thinking for a test while i'm watching i could shark it in. They have thicker walled versions but they don't align with any fittings I can find because they work off ID instead of OD. I would really dig watching this - i once watched an airlock develop in clear pex on a system i temped up for a couple days. i'm a visual kind of guy. i know how it works in theory but i like to see it. really cool although i don't know if its ethical . . . if positioned just right it could do the trick but i think for my budget i'm going to try polycarbonate and 1" sharks just for a trial. i'll let you know how bad that goes. update. per hour hot steamed firing condensate for sample trap leg 11 gallons. the legs have similar radiation and square footage serviced. obviously that is outside high volume case. Even in single digits cycles were like 45 mins and that was from luke warm start so you weren't condensing much for first 8 minutes. maximum pressure was about 16" WC. I've got about 41" from WL to bottom of lowest steam main. 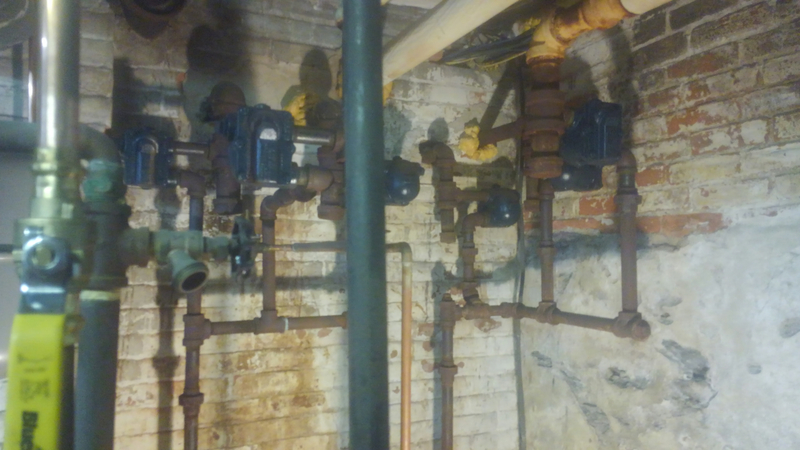 You can see all six traps in this picture that combine onto 2 1" manifolds. so I can make a pretty easy test for a single return leg with a 1" gifford loop returning 10" above water line with minimal piping and work. The eventual target would be a 2" tee 2" above the waterline. Does any of this sound right and what formula should I used to size the drops to the manifold and would 2" accommodate the estimated 66 gallon and hour max load of condensate for the all 6 legs? A rather nice illustration, @archibald tuttle , of why drips and returns don't have to be all that big - 11 gallons per hour (somewhere around 80,000 BTUh, give or take) just isn't that much water.